Corn futures are up 98 percent, wheat gained 67 percent, raw sugar advanced 44 percent, and rice jumped 25 percent. My basic thesis is that the U.S. is an empire in decline. In the past, it has made some brilliant moves that secured its place as the supreme economic, political, and military leader of the globe. But in its twilight years, America has fallen prey to the common trappings of empire: military overreach, an entitlement mindset, and currency depreciation. When will the U.S. Dollar collapse? Here’s a brief timeline that summarizes the rise and fall of the U.S. Dollar. It also details the decline of the dollar due to the petrodollar collapse. The coming breakdown of the global petrodollar system will result in the total and complete collapse of the U.S. Dollar. And yet, very few people have even heard of this system, let alone understand it. In this article, I will introduce the concept of using foreign currencies for savings diversification and will discuss nine currencies that have outperformed the U.S. Dollar. Welcome to a new financial teaching series on our DSL™ Savings strategy. In this first teaching article, I will briefly explain some of the various ways in which you can hold your one-third in U.S. Dollar denominated dollars when using our DSL™ Savings strategy. What would happen if the U.S. Dollar were suddenly dropped as the world’s reserve currency? Here are 7 economic consequences of a dollar collapse. While the yuan is still years away from being able to displace the dollar in global trade, it is inevitable that the U.S. dollar will continue its downward trend which will require the rise of other currencies. The two contenders to watch closely in the coming years are the euro and the yuan. This Week’s Topic: How (And When) The Dollar Will Collapse. This week’s special guest interview: Bill Provenzano known as the Christian Trading Coach. Follow the Money Weekly Radio is a financial radio show about the stock markets, commodities, energy investing, the global financial crisis, how to prepare for the coming hyperinflation, where to invest money, how to buy gold, how to buy silver, saving money, finding a financial advisor, and paying off debt. Hosted by economist and best-selling author, Jerry Robinson. 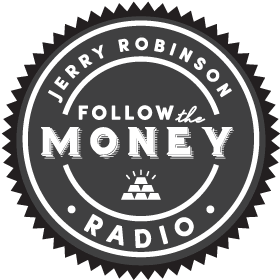 For the best in financial news, listen to the Follow the Money Weekly Financial Radio Show.